The result of my butter cookies recipe is tempting. Crisp and smooth, these German cookies melt in your mouth. Butter cookies are eaten all year round, think of the well-known Danish butter cookies in the tin box. However, the Butterplätzchen we bake for Christmas in Germany are different. They are much thinner and come in typical Christmas shapes like stars, bells, moons and Christmas trees. 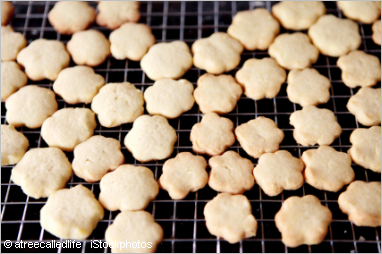 Butter cookies recipes are usually simple, based on a shortcrust pastry dough. What makes them a favourite Christmas cookie is the fact that kids love to help and decorate the Plätzchen with sugar sprinkles, chocolate, smarties and coarse sugar. Sift the flour on a board, cut the cold butter, put the egg yolk, sugar and butter chunks on top of the flour. Blend the ingredients by chopping with a large knife or palette knife until you get a crumbly mix. Then use your cool hand to quickly knead a smooth dough. There shouldn't be any butter pieces left in the dough. Wrap the dough in clingfilm and refrigerate it for 1 hour. Dust a board and rolling pin with flour, roll out the dough 3 - 4 mm thin. Dust cookie cutters with flour and cut out the Butterplätzchen, put them on a baking sheet lined with parchment paper. Whisk the egg yolk with 1 tablespoon milk, brush the cookies thinly. 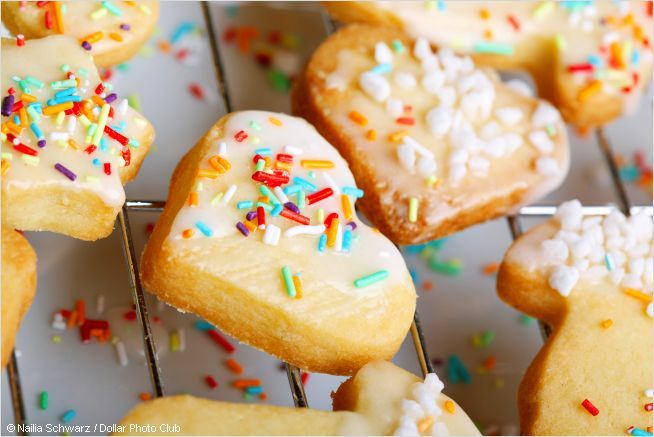 Now you, can decorate the Butterplätzchen with coarse sugar, coloured sugar or chocolate sprinkles. This would be the most traditional way to decorate them. Bake at 180°C / 356°F for 8 to 10 minutes until golden. Let the cookies cool on a cooling rack, store them in a tin box. Heidesand is another favourite kind of butter cookies, especially in Lower-Saxony. These cookies got their name from their texture, they are crumbly like baked sand. Heidesand is just delicious. Carefully heat the butter in a pan until it is light brown. Let it cool down and put it into a mixing bowl. When the butter is firm whisk with a handmixer until foamy, add suggar, continue whisking for about 10 minutes to get a thick white cream. Add almonds and the sifted flour, knead to get a firm dough. Form a 3 to 4 cm thick roll. With a sharp knife cut 5 -7 mm thick cookies. Coat the cookie's edges with sugar and place them on a baking sheet lined with parchment paper. Bake at 150°C / 302°F for 20 to 25 minutes until golden. Don't put the the cookies too close together on the baking sheet, leave some space between them. Cookies can burn quickly, always watch them while they are in the oven. Ovens are different, baking time might differ. Now did I make your mouth water? Check out my other Christmas cookie recipes. Happy baking! Don't have time for Christmas baking? 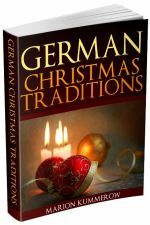 Check out original German Lebkuchen & other goodies below.